In Dolls > Cloth Dolls > Show & Tell and Military and Wartime > World War Two > Show & Tell. I need help indentyfing this doll, i got this as a gift long time ago. I dont know what is that, how much is it worth, and where to look for help getting information about this doll. It only says Freedie on the pin. 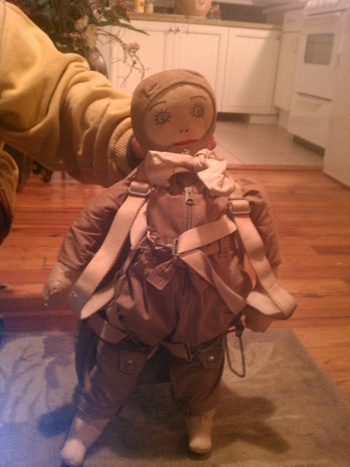 There was another person that had a WWll doll that reminds me of this one. They had a doll that was marketed back in the day called Raggy Doodle. This one I believe is home made, and the pin may be the person they made it for. That being said it makes it hard to put a value on. The good part is this appeals to a bigger market. It would be interesting to those that like folk art dolls, military and doll collectors. I would say the bigger interest would be military. It's very cool. It certainly looks like it isWW2 era. Based on the leather name tag and "seat" chute, I believe it represents a Navy pilot. I would think that this was a manufactured item-- maybe just made in a small quantity. That looks about right to me Jason. What do you think? I have never seen a manufactured "doll" with a gas piping before. Thank you Jason. I didn't think I was crazy! That makes this very cool then. So this is youtube military movie clip is cool.. From my little playing around research I found many different types of these dolls. We called one "Oscar" I didn't think this was just a doll :) Thanks for the history lesson! Shoot we must have posted about the same time. Who owes who a beer Kevin? I'll have to check that out. I never learned much about that war. My Uncle until recently refused to talk about it. My father did too, he had several injuries from an explosion in a jeep, and all I know is he hated to fly. My cousin who retired 1975 as Lieutenant-Commander. Nuclear Power Engineering Submarine Service until 1962. Told me only one thing. There are two kinds of ships, submarines and targets. My Step Dad traveled with Patton in WWII and he never mentioned this more he talked about how much Patton was not liked by the men . I guess he never saw one of these but it makes sense . That sentence should read " Sorry Patton " Your troops did like you ! I know we got side tracked here from Military Dummy (doll) but I would love you to hear my Step dads video as he was a secretary to Mc Arthur and he does talk about soldiers that became so stressed in War they became mentally ill . Having worked as a RN in a Vet hospital during Nam I am sure a lot of soldiers became mentally unable to perform . It Takes a lot to see war . My Son has served in 3 wars and did not come out totally unscathed by seeing his men killed and himself as well . Long history of all men in service here . He just retired after 30 yrs in . And Semper Fi from my Husband . Always a pleasure to learn and share . So back to our Dummy now that we know what he is his value has increased greatly as I would imagine not many came back however he looks like he never served he is to clean but what a great gift Juno !!!!!!! Wow! I am sitting here just blown away right now AR! Thanks so much for sharing your knowledge!!!! The history and discussion of these early psyops operations is very interesting-- the diversion campaign was integral to invasion success of WW2. As far as the doll, I wouldn't be so quick to attach a definitive attribution of military diversion ops. 1. The doll is rigged as a pilot with a seat chute not as a paratrooper. 2. The doll has many attributes that I wouldn't expect in a military version: silk scarf, colored eyes and mouth, name tag, and a zippered jacket. Additionally, what does the doll weigh? It would have to have some weight to it in order to look correct when falling. Is there even a parachute within the rigging? I would recommend some more research to definitively ID this a as military used dummy parachutist. Answers to the weight and parachute would be a good start point. Can you check on it Juno? One other detail: as someone who has made several military parachute jumps, I can tell you that exiting the aircraft would probably tear the "helmet" with its one snap right off of the head of the doll! Also, the "helmet" looks like an aviator soft helmet rather than a true helmet. do you gays have any idea the price of this doll ?. Or who can do estimate of the price ? The parachute dummies were made to replicate ABN troops not pilots. The 11th ABN was in the pacific theater and made combat jumps. I have never seen any documented use of individual decoys thrown after a shoot down. I haven't seen a DOCUMENTED WW2 ABN dummy that resembles this item. Everything on this item (in my opinion) points to it being a doll. As a late WW2- 1950 realistic doll, I would put a value of a couple hundred. If it were PROVEN to be a military parachute dummy, then it would be worth several thousand! That huge price difference is why I would not be so quick with attributions. It does not match any known examples of parachute dummies and for a good reason: it is simply a doll (in my opinion). Good luck with additional research! Is there an actual parachute in the rigging? Does the zipper function-- what is underneath? Is the entire parachute removeable? Posts to a sold "WW2 paradummy" really aren't helpful unless there is a link to show what is actually selling. The $300 item MAY have been a doll incorrectly identified or may have been in terrible condition! A REAL paradummy from WW2 will bring several thousand. As an example an authentic Civil War frock coat is worth about $2500- $5000. Factors such as condition, rank, ID, etc... will determine the price. However, I can quote an auction closing of a "Civil War frock coat" for $500. The only problem is the item was NOT Civil War era! One other thing on the doll-- which I think is very important and really highlites that it is in fact a doll and not a military paradummy. I mentioned it before but didn't give a detailed explanation. A military paratrooper's parachute is deployed using a static line. This is a long cable that runs from the back to front of the aircraft. The soldier hooks up to the line and then jumps. Within 3 seconds the chute is pulled out of the rigging and deploys. There is NO ripcord to pull unless there is a malfunction and need for the reserve. This is how paratroopers jump and what a paradummy would need to simulate. This doll has all of the fittings and rigging for a seat chute. A seat chute is manually deployed by the jumper after clearing the a/c. If this was a paradummy, why would it have all of the detailing to show a pilot? Post #46 shows what may be a paradummy, but it is not a Rupert or Oscar. If you look closely it is listed in the Korea category-- it is not WW2 era. If it was original WW2 the price would be great. Correction-- Post #46 shows what may be a paradummy, but it is not a WW2 ERA Rupert or Oscar. This REAL Rupert doll offered in 2009 at auction with an estimate of 1000 euro. Look under auctions/ Auction 57/ Lot 4531. This original Rupert looks nothing like the doll Juno has posted ,The other ones were movie props shown ? What does it weigh? Between 7-12 LB i belive. Is there an actual parachute in the rigging? Yes. Does the zipper function-- what is underneath? Zipper works, i can take off all clothes of the doll. There is 3 zippers in total. Is the entire parachute removeable? Yes, its like a backpack. i opened the backpack and there is full parachute in there and unlocking mechanism. Your answers reinforce (to me) that it is a doll and not for military use. 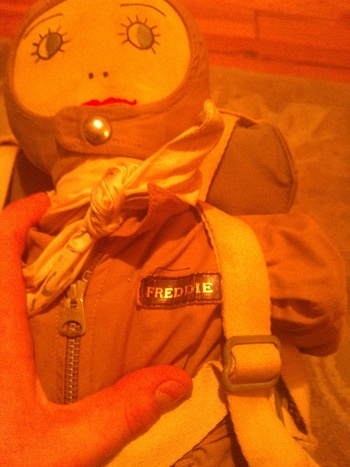 It is highly detailed doll and probably (MY speculation) a base exchange item that was marketed to pilots as a life- like doll for children. I think it is unusual and in fine condition and would expect it to bring a couple hundred at auction. Thank you for your help i really appreciate that. Can you refferr me any auctions? And do you know any places where i could ask for more information? Because recived that in the will. There was only 6 dolls like that made, for those six pilots. Its from the same material as clothes of the pilots, and detailed for the same look. It was either WWI or WWII era. I got this in a will from the guy that was born in 1920, he was a son of the pilot. So pilot had to be born before 1900. They were going to invade europe as i know. The doll is WW2 or slightly after. The uniform and parachute match that era. Any auctions you could reffer to me? Juno your note about will makes so much sense that it was a gift to some pilots . I and Scott agreed on it being a doll but clothes were professionally done to such accuracy it had to be special . Your Doll aka Replica Pilot suit from WWII is rare and wonderful . If I was going to put in an auction it would be a military special type auction not a local one as they may not have the interest or knowledge about how rare he is . You will have to pay auction house a % usually 20 % of sale price . I would expect it to go at right auction for $200-$500 depending on crowd and having 2 bidders at least that see the importance in doll maybe more . Not sure which state your in but you can do Ebay and put a reserve but you need to explain to people what the doll is all about . Good Luck . Oh was the person that willed it to you named Freddie ? Thanks to all for this interesting topic and all the knowledge I gained on Military and Thank you Juno for sharing him with us . It is a great doll. I don't know that military collectors will go to what it is worth (in my opinion about $200- $350). That is a lot for military collectors to pay for a "doll"! 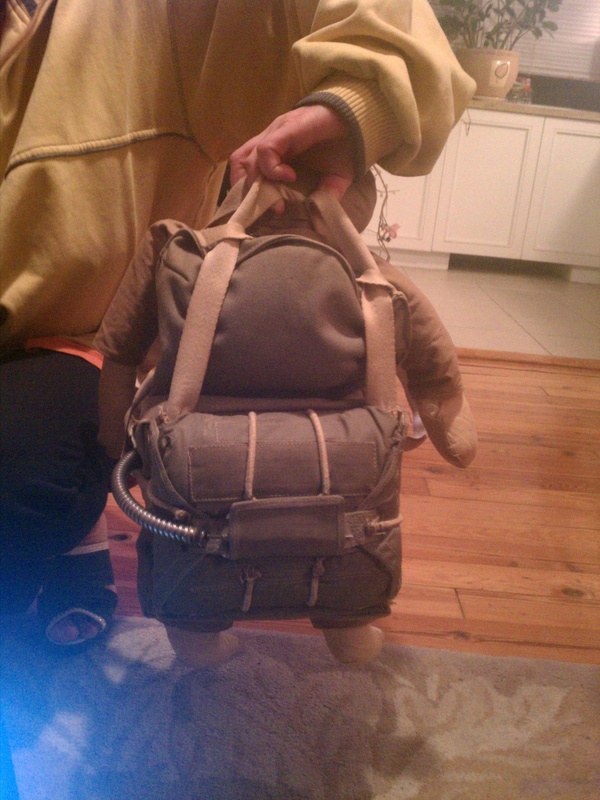 I have the exact same doll including a bag with leather name tag on it. The AN6510 parachute pack is perfect down to the last stitch. There is a sizable canopy with the 24 shroud lines and rip cord. There is vertically no way to tell the real from the dummy from a distance. I would love to find more info on it. It is the attention to detail that gets me. From what I have seen it was or may have been sold as gifts from pilots to their families back home. All the markings are correct and just like the full size one has the data on a piece of fabric again just like the real one. If anyone knows more please let me know. It is not a rupert as I have had plenty of those over the years and the quality and workmanship is far better on the rag doll type. 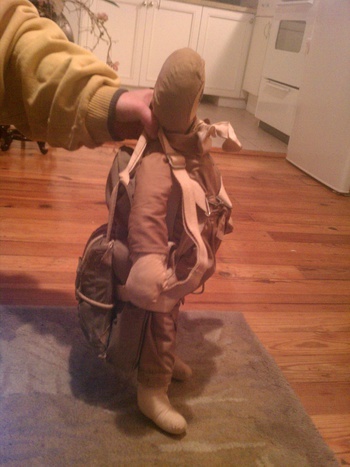 I am not sure of maker but these replica dolls were often given to children by fathers in Military to play with a bond with Dad while he was off to war. The had to have been made during WWII and doll is hand made with factory clothes made for it . Very hard to find but I have seen a few . I suspect they were sold on base .